The Maryland Division of The Children of the Confederacy® is an auxiliary organization of The United Daughters of the Confederacy®. In an effort to unite all Divisions of the CofC, the UDC founded a General organization, and it began holding General CofC conventions in 1955, which have continued annually to present. 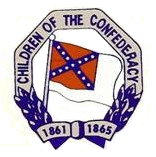 Because we desire to perpetuate, in love and honor, the heroic deeds of those who enlisted in the Confederate Services and upheld its flag through four years of war, we, the children of the South, have united in an Organization called the “Children of the Confederacy,” in which our strength, enthusiasm, and love of justice can exert its influence. We, therefore, pledge ourselves to preserve pure ideas; to honor the memory of our beloved Veterans; to study and teach the truths of history (one of the most important of which is that the War Between the States was not a rebellion, nor was its underlying cause to sustain slavery); and always to act in a manner that will reflect honor upon our noble and patriotic ancestors. -To honor and perpetuate the memory and deeds of high principles of the men and women of the Confederacy. -To observe properly all Confederate Memorial Days. -To strengthen the ties of friendship among members of the Organization. -To serve society through civic affairs and to perpetuate National patriotism as our ancestors once defended their beliefs. Catechisms are a part of the culture and history of the CofC. Members are encouraged to recite basic beliefs and elements of Confederate history. Children compete at all levels to display excellence. The second vice president is responsible for educational work. He/she should encourage members to write essays, poems, and to do artwork for General prizes. He/she is also responsible for catechism orders and encouraging Chapters/Divisions to hold catechism quizzes. It is also part of the second vice president’s job inform members regarding bookplates and scholarships. Catechism and bookplate order forms, education circulars, and scholarship applications are available from Division Directors. Interested in learning more about the CofC?